This family-run bed and breakfast is a 10-minute walk away from Stephansplatz and St. Stephen's Cathedral. It offers a rich Viennese breakfast, and the Airport Bus stops 500 metres away. Set in a late 19th-century building, the spacious rooms at Schweizer Pension all have a cable TV and telephone. Breakfast includes Viennese mélange coffee, soft-boiled eggs, different types of jams, and a selection of white and rye bread. Cereals, yoghurt and fruits are also available. Schweizer Pension offers free Wi-Fi in all rooms and in public areas. 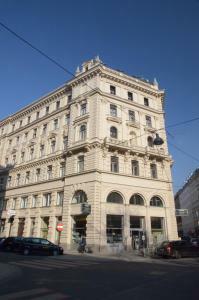 The bed and breakfast is 550 metres from the St. Stephen's Cathedral and 700 metres from the Hofburg Palace. Bus line 3A and 2A, which cross the historical centre, stop only a few metres down the road. Schottenring Metro Station, on the U2 and U4 line, is a 5-minute walk away. The distance to Schwedenplatz Metro Station, on the U1 and U4 lines, is 700 metres.